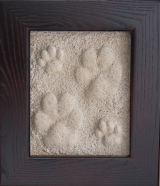 Make a beautiful lasting impression of your child's hand or baby's feet, or you pet's paw. 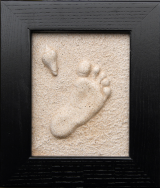 This baby casting kit contains everything you need to make a raised plaster cast with a natural sand finish, including a quality frame, available in six beautiful colours - Black, Honey and Mahogany,Cream and our latest additions taupe and barnboard. Pressions comes with clear easy-to-follow, step-by-step instructions as well as picture illustrations. Help keep your memories clear, we all know a picture is worth a thousand words - Pressions is a lasting touchable memory, as close to the real thing as you could wish for. Great gifts for new babies for mother's day and father's day! Quality frames are available in five colours - Cream, Mahogany, Black, Taupe and Barnboard!